Jalandhar, November 9: The Delhi chief minister and AAP supremo Mr Araivind Kejrawal is a liar and grossly misusing the states exchequer. Accusing Mr Kejriwal for misusing the states resources S. Charanjit Singh Channi, congress legislature party leader said that he has already backed out from every announcement, which he committed to the people before elections. Today he is relishing the salary as a chief minister, full security and even international trips on states exchequer. This is the man who termed himself as AAM AADMI. Presenting some facts before the media at Jalandhar during the third day of his “Jawani Sambhal Yatra”, Channi said that Mr Kejriwal withdrew Rs. 13,43,500/- as salary of the chief minister from 14-02-15 till August 2016. The expense borne by the security vehicles accompanying him is more than 27 Lacs in just 19 months. As a chief minister he relished international trip to Vatican city Rome Italy spending 10,000,00/- from the state exchequer. More than this he spend Approx. 55 Cr on the publicity of his government in the month of March 16. This money was meant for the people of Delhi which he diverted for his politival motives. He should have used party fund rather using taxpayers money. Tomorrow this can happen to the Punjab’s exchequer also if the people give them a chance. Welcoming the decision of the Narendra Modi government to demonetise currency notes of Rs 500 and Rs 1000 denomination, the Punjab Congress Legislature Party chief Mr Charanjit Singh Channi said rather that causing harassment to the common man, the centre should have given priority to checking the creation of black money itself. It is the sources of black money that should first be plugged. Mr Channi pointed out that the UPA government had phased out Rs 500 notes oriented till 2005 earlier without creating such of a problem for the common man. However, the current decision would affect the lower middle and working classes and small traders the most and would put brakes on the economy initially. He said this decision freeze payments, freeze trade and the functioning of an exchange economy. The most severely hit would be the vendors, small kiryana shopkeepers, milkmen and daily wagers who depend upon immediate cash payments. He said none would question the steps taken to wipe out black money from the economy but reminded Mr Modi of his promise to bring back black money stashed abroad that later turned out to be his ‘jumla’. The Prime Minister had not come out with the plan to check the creation of the black money itself. This was a half-measure and that too causing more harassment to the common man. Mr Channi said the country would like to know as to what action was being taken against those who had hoarded black money in the shape of investment in real estate, gold and the like. This section would not feel the pinch. 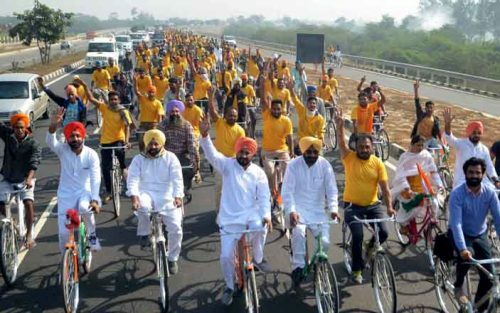 Channi’s “Jawani Sambhal yatra” entered third day today, flagged off from Phagwara by Sh Mohinder KP reached Jalandhar and rested at Baba Jauran village Raipur. Ch. Santokh Singh, MP, S Amarjit Singh Samra, S Kamalijt Singh Lalli, Sh. Yashpal Dhiman, S Daljit Singh Ahluwalia, Kaku Ahluwalia, Sh. Rajinder Beri, S Jagbir Brar, S. Vikramjit Singh Chaudhary, Dr Navjot Dahiya, Hardev Laddi, Jasleen Sethi, Satnam Kainth, Rana Randhawa, S Satnam Bitta, Sushil Rinku, Pawan Kumar, Surinder Mahey, Dr Manjit Saroya and other congress leaders accompanied the yatra enroute. The yatra will start from Dera Baba Jauran tomorrow and go to Dera Ballan and reach Beas.